Fun Lawn Mower Engine Projects You Can Build at Home Cheap and Easy! Chester Greenhalgh’s latest fun eBook applies hot rod creativity to the small engine world. 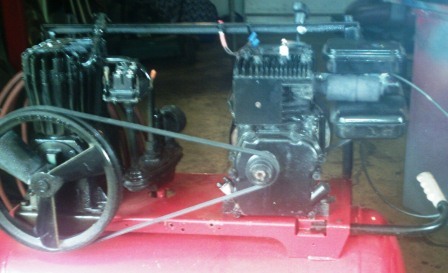 Chester Greenhalgh does it again — with new Lawn Mower Engine Projects! The author of the legendary “How to Build a T-Bucket Roadster for Under $3000” and “How to Mount a Cheap Antique Pickup Truck Body on a Late Model Frame” has done it again with his latest eBook that will make you an overnight small engine expert and show you how to apply “hot rod” creativity to cool new lawn mower engine projects for not only your with lawn mower but also for boating, air compressors, minibikes/choppers and more. 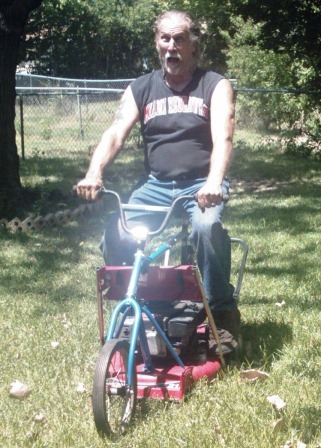 After being temporarily forced by the escalating wave of Mexican violence to abandon his hot rod hacienda, Chester decided to keep his hot rod building chops sharp by focusing his mechanical talents into a field that has plenty of creative possibilities but can be attacked with only the most limited hand tools, in a small space, and on a beans and cornbread budget: Projects With Lawn Mower Engines. While there are tons of small engines out there, Chester makes it easy by dealing with the single most popular: the Briggs & Stratton flathead engine. They produced millions of these engines every year for decades — and you’ll find them everywhere. These “Briggs” engines are so popular in fact that in the go kart world experts call them the “small block Chevy” of the karting industry. And because changes through the years were minimal, parts are plentiful, easy to find and cheap! In fact, you will probably find many totally serviceable engines on equipment that was tossed out for the garbage man. According to Chester, “Most people may understand cars but are lost with these cantankerous little bastards”. And we’re not kidding about how readily available and cheap they are. When Chester made a recent trip to his friendly local scrap metal yard he found two giant containers filled to overflowing with lawn mower engines! You’ll learn the cheap, easy way to diagnose what’s wrong and how to get them running quickly. Once you understand these little engines you could even open a small side business fixing them for extra income or to fund your hot rod building project. There are lots of people who simply don’t have the space or the tools to put together a hot rod yet like to work with their hands and creative minds on something mechanical. 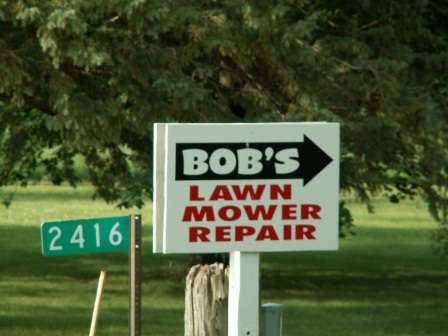 A lawn mower engine provides the perfect outlet. Lightweight, cheap, powerful, easy to work on and doesn’t require a lot of space for a project. You can even convert a spare bedroom into a comfortable work shop or ‘Man Cave’. 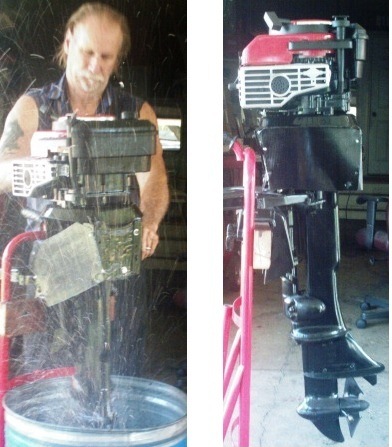 Chester Greenhalgh’s third eBook, Projects With Lawn Mower Engines, continues his successful tradition of providing practical information for building fun, creative lawn mower engine projects with a minimum of tools and money. Take a look at what all he’s packed into this eBook that will provide hours of enjoyment, save you all kinds of money and make you the envy of the neighborhood. How to avoid wasting your time and money on an engine with a bent crankshaft — a not uncommon problem with lawn mowers — or other internal problems. How to disassemble, clean and paint the engine the right way. Cylinder honing pros and cons. Reconditioning cylinder head and valves. Chester priced a valve grinder — over $400 for a tiny machine! So he went home and made one for under $10 out of some scraps of wood, a 3/8” drill, a carpenters square and a flat file. It works perfectly, and he shows you how to build your own. How to set clearances, properly torque the assembly, and unravel the mysteries of the governor. Why? With the newer style you don’t have to mess with the spring exploding when you change the rope. Plus, the newer governor is more efficient. Why? The older carburetors have been around for close to 50 years virtually unchanged because they worked so well and the motors started so easily. Chester explains and shows how to replace the float type carburetors to avoid being plagued with problems with leaking, hard starting, quitting, and rough running. Changing the old style points system over to electronic ignition for improved starting and performance. The early Briggs & Stratton engines had points under the flywheel which required pulling the flywheel for service. When Briggs changed over to the new electronic ignition it was one of their greatest advancements. Chester tells you how to update it easily and economically. How to replace the frustrating automatic shut-down feature with a simple kill button you can get at RadioShack. Follow along on this lawn mower engine project as Chester builds a mini chopper using a junk scooter and a 2 HP edger for a donor. 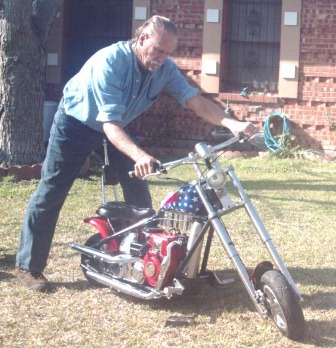 The same process can be done with any junked out mini-bike or scooter. This is a real gem. There are loads of decent air compressors just the size you need to properly run air tools and paint that somebody is either selling cheap or giving away because the 2+ hp AC motor failed and they’re not ready to spend a couple hundred bucks to replace it. In this lawn mower engine project, Chester shows how to replace that motor with a cast-off Briggs engine for a fraction of that. And here’s what’s really cool. If you’re one of those guys who doesn’t have easy access to 220 Volt AC power, this is your answer. Now, you can take that compressor anywhere you can roll it — like out in the driveway or behind the house. There are a lot of old, discarded, small outboard motors that are lying around because the parts are impossible to find and they are not too reliable to start with once the new wears off. Usually the water pumps are the first to go and most of the manufacturers don’t continue producing the parts to fix these older motors. Perhaps their reasoning is; if you can’t fix your old motor, you’ll buy a new one. But, there is an abundance of old lawn mowers with vertical shaft motors kicking around. Chester shows the way to combine these two cheap resources to produce a dependable small fishing motor for everyone to enjoy on a small boat or canoe. Something that can be built from everyday, inexpensive used parts, and doesn’t require a factory trained mechanic to work on. This is probably the most construction detail ever published on how to do this and Chester covers all the angles so you get a nice-looking, reliable result for your boating pleasure. An explanation of the differences between a supercharger and a blower and how something developed in the 70s for smog control on cars can be adapted to make the small Briggs engine a big performer. Combine a self-propelled lawnmower with a bicycle and watch out! Hey, if it’s a weekly chore it might as well be fun. Chester shows how to build this totally unique lawn care appliance that will have you “rooting” for the grass to grow so you can go out and mow. Guaranteed to blow the neighbor’s minds. According to Chester, “Lawn mowers are really just big toys that have a useful purpose. You can let your imagination run wild with what you want to do to one.” Chester offers some inspiration by sharing how he turned one of his favorites into one that turns heads of every car that passes by. Plus: 2 BONUS Chapters added! After finishing this eBook, Chester produced two more cool BONUS Chapters to make it even more of a must-have. These two new chapters add over 20 pages and close to 60 more informative instructional photos to the package. After finishing the chapter on Customizing Your Lawn Mower, Chester realized that it would be helpful to cover the specifics of how to paint mowers on a budget while still getting that eye-catching custom car look. You’ll follow along as Chester takes you from start to finish on one of his trademark custom mower paint jobs. Talk about adding value to an everyday object! 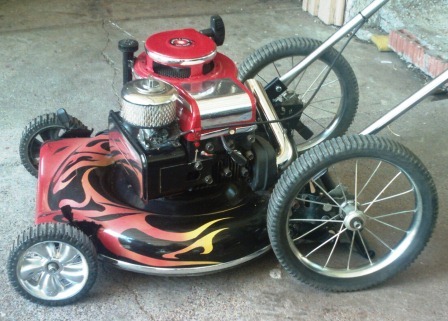 A custom-painted mower will sell for way more than the run-of the-mill red jobs. Another nice extra income business opportunity. The title pretty much says it all on this fun ending to another fascinating Chester eBook. A guaranteed winner for when your friends come over! This fun Projects With Lawn Mower Engines eBook is packed with knowledge delivered in the entertaining style that made Chester’s first hot rod “how to” a legend. Chester writes just like he’s speaking to a friend, so he’s candid, humorous, sometimes shocking, and always on the money with his comments. Speaking of money, Chester’s become famous for showing you how to save money, whether the subject is “How to Build a T-Bucket Roadster for Under $3000” or his latest, “Hot Rod or Rat Rod: How to Mount a Cheap Antique Truck Body on a Late Model Pickup Chassis for Under $3000“. Everything is clearly and carefully explained with the aid of over 180 color photos. And Chester’s not kidding one bit when he says “Once you understand these little mower engines you can even open a small side business fixing them.” But what’s really cool is being able to learn enough that you don’t have to send your own to the shop after spending untold hours trying to figure things out. Of course, that’s just a bonus on top of the fun projects you’ll discover in this new eBook, Projects With Lawn Mower Engines. Plus, when you order now you get two versions of this eBook! One version is on a rich color background to make your on-screen reading more enjoyable. The second version is meant for streamlined printing that will save ink on your home printer. All this great lawn mower engine projects info for only $9.99. But wait — here’s your special deal on the Chester Greenhalgh eBook library: When you order two of his cool eBooks you get 10% off. Order 3 and you save 15%. Order all 4 of these terrific hot rod how-to eBooks and save a big 20%! The informative and practical Chester Greenhalgh hot rod how-to eBook library. Take advantage of this opportunity to also order “How to Build a T-Bucket Hot Rod Roadster for Under $3000: kickin’ it old skool”, “How to Build a Full-On Radical Custom on a Beer Budget!” as well as “Hot Rod or Rat Rod Truck: How to Mount a Cheap Antique Truck Body on a Late Model Pickup Chassis for Under $3000“ and save up to 20% when you order them all! Make your choice below to securely purchase through PayPal and then immediately download tons of great hot rod “how to” information that will save you thousands of dollars, make your projects go faster without unnecessary frustration and keep you entertained as a bonus! How to Build a Full-On Radical Custom Truck or Car on a Beer Budget! Once you’ve completed your payment using PayPal’s secure server you’ll receive an email with your personal download link and instructions for downloading along with your receipt number. Thank you, and don’t hesitate to use our Contact Form if you have any questions or problems. Copyright HotRodPlans © 2017 HotRodPlans · 104 E. State St. #730 · Sycamore, IL 60178 · U.S.A.